Here in North America we are settling back into our daily routine after a summer of travel around Europe. We are watching autumn unfurl in fiery red and gold foliage - with glorious sunsets floating in brilliant pink and orange. It's easy to move on with the hustle and bustle of everyday life, but today we're having a throw-back moment - visiting the Aquitaine - one of the most diverse regions of France. Come on along and enjoy food and wine with us - at this storybook castle. The alluring Gironde countryside is a wine lover’s paradise and every traveler’s dream. This appellation is a feast for the senses: panoramic views, storybook castles, chateau-dotted hillsides, and winding rivers, all nestled among flourishing vineyards, in the heart of the Aquitaine. Here we discover the time-worn Cazeneuve Castle, an ancestral residence for the House of Albret-in the small commune of Préchac, France. 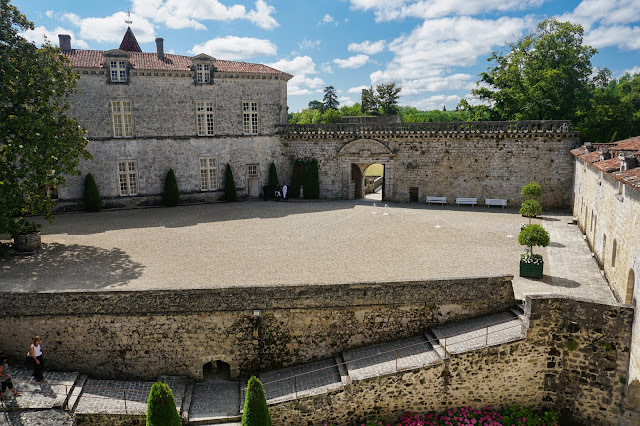 Located between the wine regions of Bassin d’Arcachon and the Sauternes vineyards, is the historical Château Royal De Cazeneuve; a family jewel of the Duke of Albret. First built in the eleventh century and it became the residence of Henry IV and Queen Margo, and where history still lives on. Today this fortified castle remains a family legacy – cascading down through descendants, of the ducal family de Sabran-Pontevés. Chateau Cazeneuve majestically overlooks the Gorges du Ciron, surrounded by a moat, and defended by two rectangular towers. 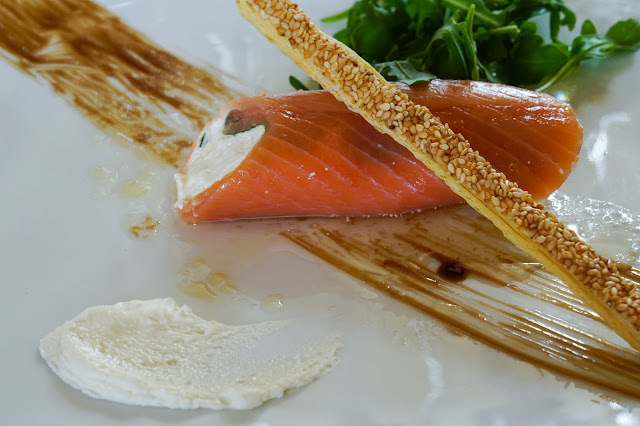 The chateau was awarded the benchmark of Tourism in Aquitaine, the prestigious two-star Michelin Green status - and the bestowed honor of Historical Monument. Here individual, private, and group tours are received; along with bespoke gala dinners, weddings and seminars, all by appointment only. 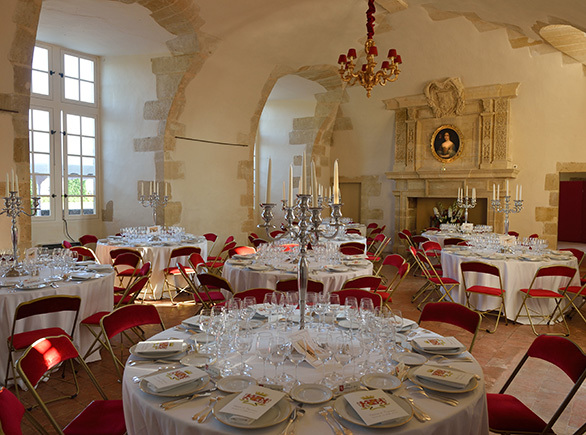 After a recent tour of the castle-fortress, medieval cellars, troglodyte caves, and royal apartments, we entered the castles large vaulted reception room. Inside the walls are honeyed limestone, warmed by a medieval fireplace, accented with red velvet chairs, and luminous silver candlesticks. Our tables are bejeweled, a feast for the eyes, with sparkling stemware and silver for pairing Bordeaux’s sweet wines, Sauternes. 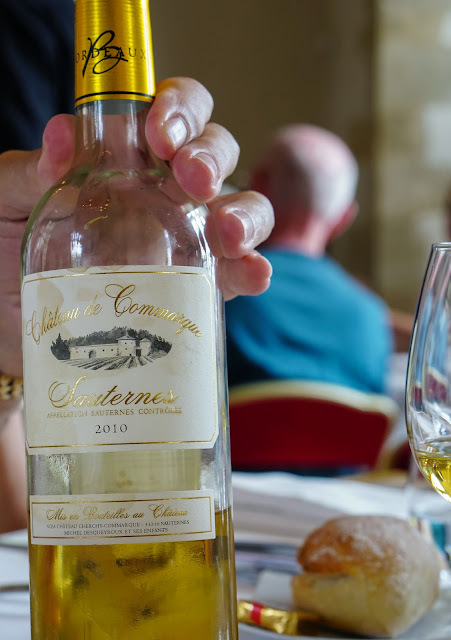 Sauternes is a French sweet wine taking its name from the Sauternes region and Graves area, here in the Gironde department. 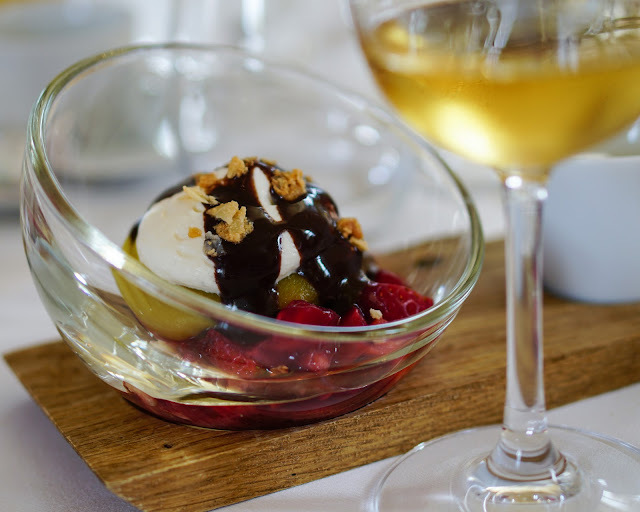 and a finish of Peach Melba on a wine barrel staved with crunchy praline – all crisp and balanced with Reserve Old Vine, Sauternes. This gilded sweet wine comes from a mix of Semillon, Sauvignon Blanc, and Muscadelle grapes that have ripened until aromatic and sweet by the Botrytis cinerea, or more commonly called, noble rot. Noble rot is a welcomed fungus by winemakers, enhanced by moist conditions from the maritime climate of the Aquitaine, accompanied by low-lying misty fog, -from the Ciron and Garonne rivers and specific terroir-viticulture. With this magical combination, grapes shrivel, resembling wrinkled raisins, resulting in fine and concentrated sweet wines of the Sauternes region, a wine not to be missed. The Aquitaine capital city of Bordeaux is among the most diverse regions of France. This protected region offers unparalleled scenery, historic sites, chateaux, and classified terroir, all waiting for travelers and wine connoisseurs from around the world to enjoy. 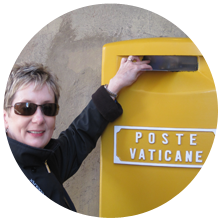 J. Christina is the author and hobbyist photographer behind Scribbles and Smiles, writing a personal travel blog from the Midwest. Christina (Christie) is married to John, a.k.a. Mr. Christie. Where Mr. Christie is right on-board with their travel jaunts around the world; sharing in their blogging endeavors. He supports, encourages, handles gadgetry and embraces the role of in-house editor - hence, their bespoke pen name, J. Christina. What beautiful pictures and commentary. Every New Year's Day my French family would have the same argument. The debate was over what to serve w/the foie gras -- Sauterne or champagne. Whoever wins the debate, I end up the winner, since I love both. I wish I could get my American friends to appreciate the glories of a great Sauterne. I will have to keep trying. Thank you for following me on Twitter. Love your Blog. Thank you for the lovely comments and sharing your enjoyment of Sauterne wines. Thank you for following me on the blog, twitter and elsewhere. Cheers.